Aussie Antlers are from Australian deer farms (not imported). They are naturally shed, full of nutrients, do not splinter, can last for months and dogs love them! Aussie Antlers are long lasting, natural dog chews. 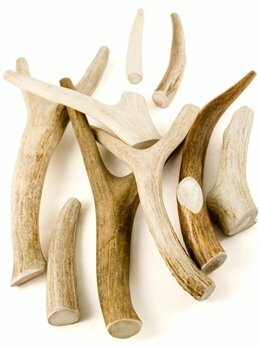 We have many years experience with antler and endeavour to match the antler to the dog because all dogs have different chewing habits. Small pieces are generally between 8cm – 12cm long and a minimum 45g. We charge by weight and will send you a piece to the value of $17 or greater. The colour, length, diameter and density of each piece varies as this is a naturally grown product. No two pieces are the same. These are best for small sized dog breeds. 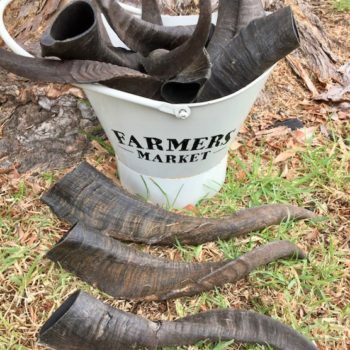 Aussie Antlers are strictly from Australian deer farms (not imported). They are naturally shed, full of nutrients, do not splinter, can last for months and dogs love them! 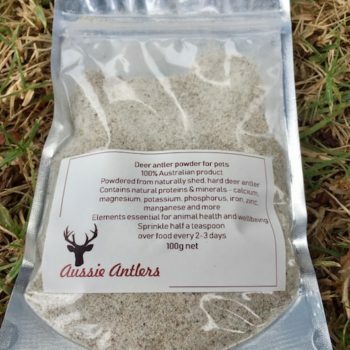 Feel free to contact us for experienced advice on which antler is best for your dog and how to get antler treats to last longer. DO THIS; when ordering online, be sure to type in your dog’s breed & age in Order Notes at the Checkout. This will help us select the most appropriate piece.